MONATE SITRUSKELDER is one of five citrus cellars in South Africa. MONATE SITRUSKELDER is the only cellar that makes Naartjie, Orange and Minneola alcoholic citrus fruit beverages. 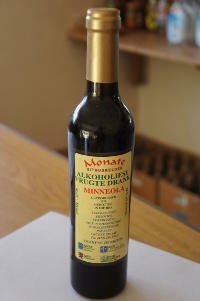 MONATE SITRUSKELDER is independent, the second largest cellar, with the largest range of citrus beverages, from Jejune, Mellow, Nectar to a Full Citrus. All the citrus fruit grown in this area is grown for the quality of the juice and not for export; therefore poison is never used on the citrus fruit. In the making of the citrus fruit beverage, the fermentation process is totally natural. The temperature in the cellar is not artificially controlled and cold fronts and heat waves form the character of each alcoholic citrus beverage. Every Alcoholic Citrus Drink, Naartjie, Orange and Minneola in the series is unique and likewise every fermented batch of every year. The citrus fruit, on the southern side of the Magaliesberg mountain valley, has a very high concentration of citric acid. Citric acid is concentrated Vitamin C, one of nature’s strongest anti-oxidants and nature’s own preservative. The citric acid natural to fruit is the preservative in the Alcoholic Citrus Fruit Beverages. These products are preservative free and have no colorants or artificial flavorings. Because these Alcoholic Citrus Fruit Beverages contain no preservatives, no headaches! A bottle open , in the fridge or on the shelf, can last several months. The shelf life of a sweeter Alcoholic Citrus Fruit Beverage is always longer than a dryer one. To mature a bottle, it need not lie on a shelf; it does not matter if it gets oxygen. In time it becomes like velvet. These characteristics make the Alcoholic Citrus Fruit Beverages of MONATE SITRUSKELDER unique. Minneola jejune is best described as another fruit, another flavour, fruity and very refreshing.